1. Spray paint standard spring type clothes pin gold. This is the angel body. 2. Take a photo of the children's faces in advance- (many can be in the photo at once because you want just small faces) or draw an angel face on card stock and cut out. The face should be about a 1 inch oval shape. Open the clothes pin and then pinch the picture to hold it. 3. Fold a small, 3-4" round doily in half for wings and glue to the back of the clothes pin. 4. 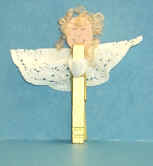 Insert a 3" pipe cleaner piece, by the round center of the clothes pin spring, and bend to the front of angel and twist into a praying hands shape. If you've used the resources at SundaySchoolNetwork.Com, then please become a Ministry Support Partner! Click here!